Shopping for Twilight Zone Prop Replicas? Order this second edition today! 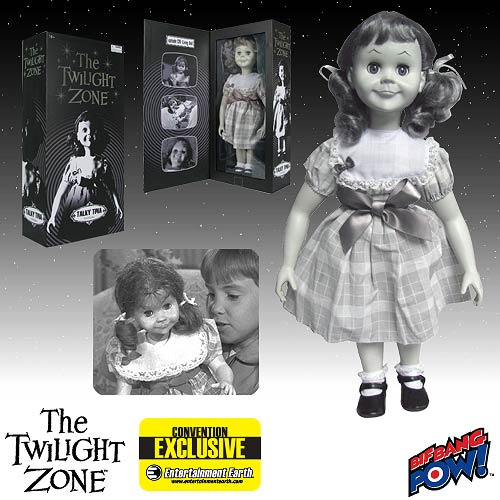 18-inch talking-doll replica from the iconic The Twilight Zone TV series. Based on the "Living Doll" episode that starred Telly Savalas. Speaks 5 phrases sampled straight from the original audio of the episode! Features eyes that open and close. The instructions included inside the product may be incomplete. Click here to download revised instructions. Talky Tina is back again... to stay! This authentically reproduced black-and-white Talky Tina Doll Replica from The Twilight Zone is a lifelike replica that stands 18-inches tall and features rotocast vinyl head, arms, and legs; soft fabric body and fabric clothing; rooted hair; eyelids that open and close; and a talking mechanism. Don't miss this Talky Tina Doll! Requires 3x "AG13" (LR44) batteries, included. Ages 14 and up.